In New York City Hot Rolled Steel Sheet is a low carbon, commercial quality steel sheet metal with a bluish silver surface finish that is used in a variety of different non- structural applications.Hot Rolled Steel Sheet has good formability and weldability properties. Sheet metal is one of Allied Steel NYC specialties.we custom fabricate numerous hot rolled steel products daily.One of Allied Steel company specialties includes possessing a tremendous amount of experience as flat sheet metal fabricators, with the skills to expertly cut, bend, drill and weld any size or type hot rolled sheet product to your exact specifications.Custom sheet metal fabrication of hot rolled commercial quality sheet for the New York City area can vary in many ways depending on the thickness.Allied Steel NYC possesses updated machinery allowing us to supply and fabricate sheet metal, meeting NYC customers exacting quality demands.Some of our fabricated hot rolled sheet products in NYC include steel sill savers, metal/steel headers, custom lintels, cross members, ribbed panels, sand shoes, bottom rails, corner posts, roof bows, landing gear brackets, light boxes and custom container parts. These custom fabricated flat sheet products are used for many different applications in numerous New York City industries including transportation, equipment parts, Cargo Ship, Intermodal container and chassis repair, specialty products, Truck Repair, commercial and residential construction and property management. We are reliable sheet suppliers and expert steel sheet fabricators serving all of NY including the 5 Boroughs and Long Island City. For New York City Galvanized Steel Sheet is a low carbon, commercial quality steel sheet, which is covered with a protective zinc layer through a process of Galvanization or hot, dip galvanizing and has a semi-bright silvery flaked surface finish.Galvanized Steel Sheet is commonly employed in non- structural applications in and around New York City, the boroughs and Long Island City, which provide a significant corrosion resistance characteristic, as compared to a hot rolled sheet, and many years without rusting.Galvanized Steel Sheet is easily fabricated into many products for New York by cutting, bending, punching and forming to exact specifications.Allied Steel NYC is expert sheet fabricators of galvanized steel,working with and supplying NYC contractors for over 4 decades. Some steel sheet products Allied NYC custom fabricates from Galvanized Steel sheet include Pour Stop for concrete floor systems, cell closure plates, steel connection brackets, steel cover plates, steel rain guards, steel shim plates, custom lintels, kick plates, corner posts, support braces and steel Roof Bows. Galvanized Steel Sheet fabrication is what we do each and every day for our many of NYC commercial and residential contractors throughout the New York City boroughs. 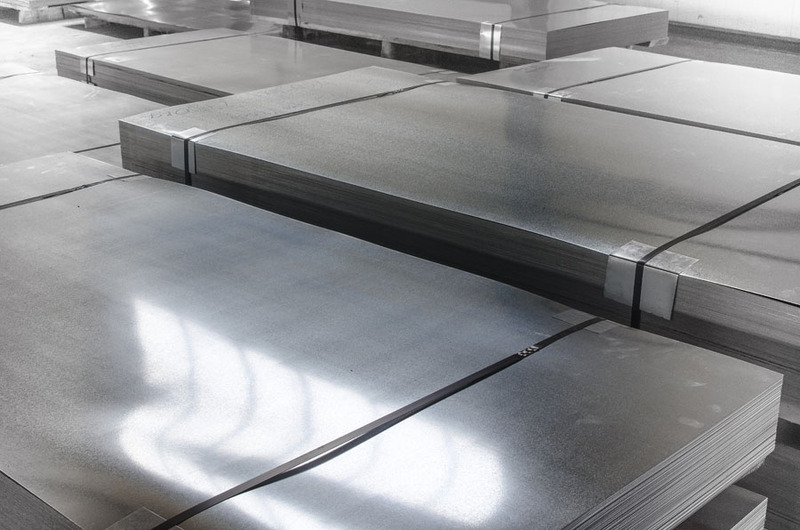 The Cold Rolled Steel Sheet is a low carbon, commercial quality steel sheet that began originally as hot roll steel coil, and then additional processing involving annealing or temper rolling.These additional processing increases the overall tensile and yield strength, improving material flatness eliminating most surface imperfections. It has a clean silvery surface finish that is widely used across New York City in a number of non- structural applications. Offering significantly enhanced thickness tolerance with a surface quality that is much better suited than that of hot rolled sheet steel.Custom fabrication of cold rolled steel sheet yields a more precise finished piece than using hot rolled material.Typically Typically Cold rolled steel sheet is used for more critical tolerance applications of products being manufactured. Allied Steel of New York is a premier Custom Steel Sheet Fabricator of cold rolled steel sheet products for NYC. Aluminum Sheet utilized for projects in New York City comes in different grades including 3003-H14, 5052-H32 and 6061-T6. Type 3003 aluminum sheets have excellent fabrication properties including bendability and weldability. Aluminum sheet Type 3003 has a semi bright silver aluminum finished surface and has many practical applications in such areas as the transportation truck repair, residential and commercial construction industries. Grade 5052 offers additional strength and corrosion resistance, more so than type 3003, often used in weathering applications such as in marine construction. Type 6061 aluminum sheet has a duller mill finish and the highest strength of the three grades, it is best suited for higher wear applications or machining fabrication, but is less formable than the other grades. Contact our staff for more details about custom fabricated aluminum sheet. Stainless Steel sheet for NYC construction jobs is available in T304 and T316 grade. Both have excellent corrosion resistance and formability properties and can be custom fabricated to your exact specifications. Grade T304 is the most popular and comes in different surface finishes including 2B mill, brushed or polished mirror. Material thickness ranges from 24g thru 3/16”. Used for multiple applications in the New York City area such as industrial maintenance, manufacturing, marine construction and commercial construction industries that require higher product strength and durability and that are exposed to corrosive elements or atmospheric weathering conditions. We are suppliers and custom fabricators of Stainless Steel products for commercial and residential construction throughout New York City. Call 212 707-8123 or email for additional information on our stainless steel fabrication services for New York. Sheet Products Are Available In Below Lengths And Widths.